Her best friend Jenni “JWOWW” Farley commented on her post, “I AM SO FREAKING EXCITED.” She wasn’t the only Jersey Shore castmate to comment though. Snooki’s reality TV family is very happy about the news. Mike’s wife Lauren Pesce, now Lauren Sorrentino, wrote “Yay! So excited for you guys! more babies! Sammi “Sweetheart” Giancola wrote “Woooo!” on the post along with some smiley face emojis. DJ Pauly D just let the emojis do the talking. Angelina Pivarnick wrote “congrats” with some lipstick print emojis. Deena took a back seat from the Jersey Shore Family Vacation shenanigans when she found out she was pregnant. Will Snooki do the same when/if filming resumes? 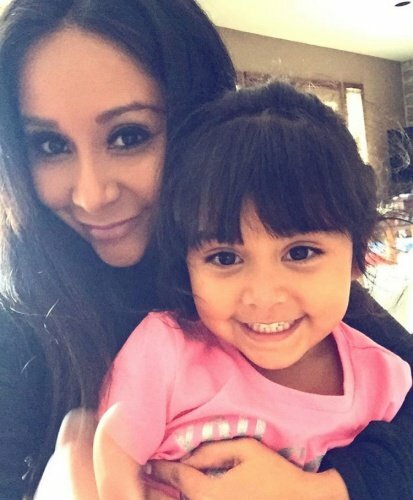 TELL US- DO YOU WANT TO SEE SNOOKI’S PREGNANCY ON THE SHOW? Is Jersey Shore Star Ronnie Ortiz-Magro Expecting Another Baby?